Which is your everyday bag for fall? What shape do you prefer? Mi piace questa borsa la trovo perfetta per il quotidiano.. I love anything leather. It doesn't have to be big. Happy new week, Lilli! Great to hear that you're happy with this bag! It looks like a good size and very practical. Ho adocchiato questa borsetta di Mango già da un bel po' ma non avendo store qui a Napoli dovrei comprare dal sito, ho solo paura che da vicino possa avere una qualità non buona visto il prezzo davvero mini! Quanto è carina questa bag!!!! Troppo di tendenza davvero! E poi il prezzo è davvero ottimo!!! NOn vedo l'ora di vederla in uno dei tuoi outfits! Ciao Lilli. Io nel quotidiano uso una shopping bag di Zara che è super capiente. Bellissima questa tracollina. This bag is lovely and, like you said, it's versatile! I see there is one more shade on the site, a beige one - the dark is my favourite! My bags for fall are bigger - I go to school and I have to cary many, many things with me! This bag is so chic and versatile Lili! I love it and it's totally you! My everyday bag lately has also been a crossbody style as well. I love having my hands free :) Have a wonderful week! Such a cute bag and so classy! I love Mango bags very much also! They are of a great quality and they last for years. Yours is just amazing one and I agree how versatile it is. I also have one black from Mng but the square one (similar to PS bag) and wear it all the time! Amazing bag, cara mia! Nè grande nè piccola! Pura meraviglia per tutti i giorni! Bacione e buona settimana! E' davvero molto bella e pratica! Yes, yes, yes. Dear Lilli I love this bag. The bag looks like the small Chloé Marcie bag. Great deal!! And i still like Crossbody too. This is a relaxed way to wear a bag. Small or medium I prefer! Like your rockish chic bag. That is such a cute bag, Lilli and I can see why you're in love with it! I rarely carry a bag nowadays because I'm carrying a diaper bag instead. I do prefer larger bags in general because I can throw in everything into it. Hope you had a brilliant weekend! Comoda e bella, ottimo acquisto Lilli!!!!! Come stai? Un grande abbraccio! Very nice Lilli. Your bag looks very Valentino. I like the rock studs. I carry cross body bags now because it is so functional. mi piace un sacco la borsa!!! Ciao Nunzietta bella! Io invece non ho alcuno zainetto, mi piacerebbe uno marrone tostato, effetto invecchiato. Tutto bene ti ringrazio, spero anche tu ♥ Un abbraccio grande grande a te! che carina e che prezzo! what a great find! 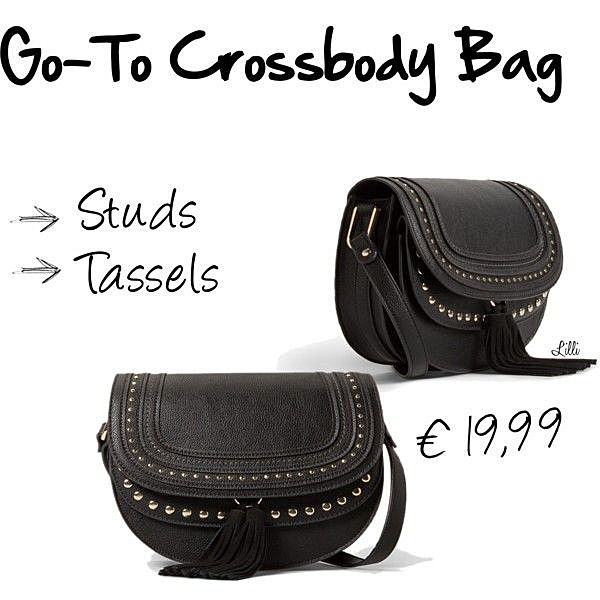 adore such bags - very easy to style and comfortable to wear! That bag is so cute Lilli! I want! HaHaHa It will go with so many things! I love cross body bags because they are stylish and chic and they don't have to be expensive; this Mango bag is very beautiful and trendy too. Have a great week Lilli. Love Valentino is so chic. That bag is lovely, kind of reminds me of a Chloe version. I'm not a huge fan of crossbody bags, long straps and me equal in disaster most days hahaha.